PNG’s new government is proposing a 100 day plan. What should this consider? A good plan begins by fully understanding the challenges and opportunities facing its people. This understanding is improved by seeing how one is going relative to neighbours (comparative public policy analysis). The list below from the ADB highlights that PNG still faces massive development challenges. It is saddening to see PNG’s poor rankings. PNG’s politicians have been failing their people. On opportunities, PNG leads the world in key areas such as its cultural richness (1st), the extent of its tropical forests (3rd for the entire island), and its extraordinary biodiversity (PNG is one of 17 megadiverse countries in the world). 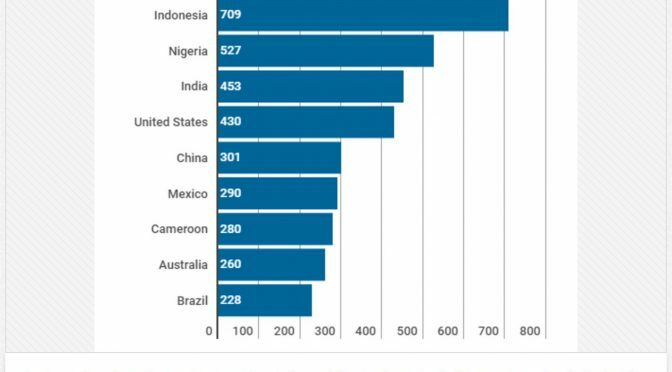 In terms of mineral and petroleum wealth, it actually does fairly poorly – even in LNG it ranks 47th and petroleum 62nd (details below). Going forward, PNG needs to change its self-image of “mountains of gold in seas of oil”. This myth (at least in world terms) has delivered appalling development outcomes for PNG – see here and here . There are much better development paths. A better self-image would be “mountains of culture in rich seas of diversity” – or something similar. (Suggestions would be welcome – but about people not minerals). PNG’s population of 8.48 million culturally diverse people is its greatest asset. 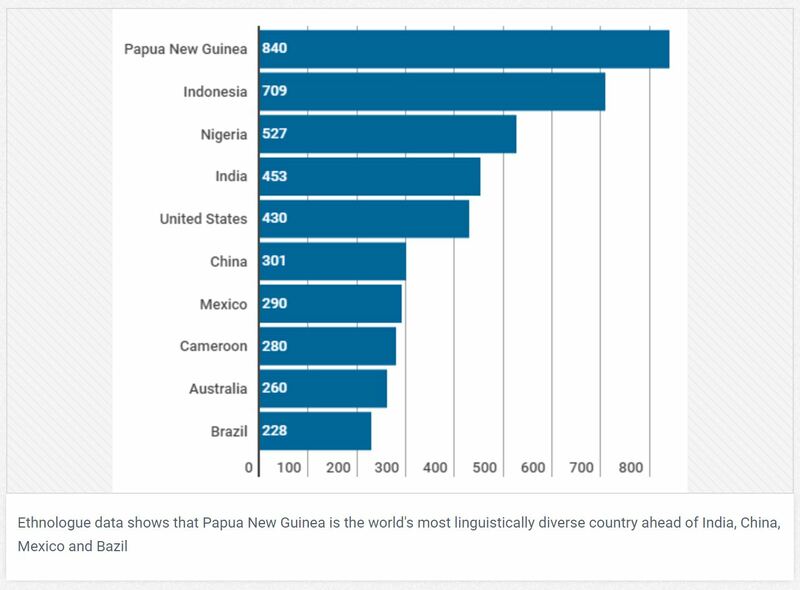 PNG’s population is 21st largest of the 45 countries in the Asia-Pacific region. More significantly, PNG unambiguously leads the world with the rich cultural diverseness of this population. With 840 distinct language and cultural groupings, PNG has an extraordinary resource in a globalising world. Surely there are people smart enough in PNG to tap into this world leading resource both as an export market as well as a tourist destination. The latest display of PNG’s cultures being translated into gorgeous fashions (PNG’s Fashion Week is underway ) is a small example of this potential. The actual volume of exports might not be as large as an LNG project, but most LNG revenues go to overseas bankers and investors anyway. PNG’s land mass is 464 million square kilometres – the 11th largest in the region and larger than other countries such as Vietnam, Malaysia and the Philippines – and more than four times larger than countries such as South Korea. PNG also has considerable mineral and oil resources, but these are usually over-stated in terms of world importance. There is a well-known expression in PNG of it being a country with “mountains of gold in seas of oil”. However, in terms of world reserves, PNG is actually not that wealthy relative to others. For example, PNG’s natural gas reserves, the source of the PNG LNG boom and the prospective Papua LNG project are estimated in 2016 to be 151.3 billion cubic meters, ranking 47th in the world. In oil, PNG’s 200 million BBL of reserves ranks 62nd in the world (The World Factbook – the CIA should know). Contrast that with its extraordinary wealth when it comes to forests and biodiversity. After the Amazon and Congo, the island of New Guinea is the third largest rainforest in the world. These forests face threats from logging, mining, wildlife trade and agricultural plantations, particularly palm oil. These forest resources are being exploited with very poor returns to local communities. And most in PNG know the power behind why the SABLs where never examined under the last government (and won’t be under this one). The business acumen of PNG’s people is frequently commented upon. 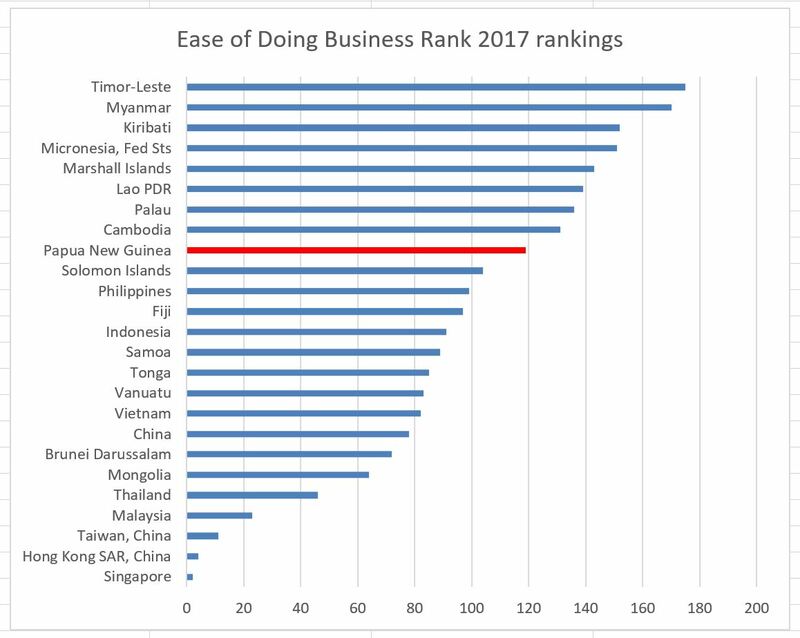 However, PNG does not create a particularly friendly environment for building up these business skills – the graph below shows how far PNG is behind most other countries in the region. Much still needs to be done in this area – and proposed policies in areas such as SMEs, agriculture and land will undermine this enormous resource. When looking over the last 42 years of PNG’s development since independence, there has been too much emphasis on a resource focus for development rather than a people focus. But the facts above indicates that PNG’s mineral and petroleum wealth are actually quite modest. PNG’s real opportunities lie in other areas. PNG of course needs to continue to use its natural resources – hopefully on better terms than in the past. But the real way forward is looking at new opportunities with greater potential for women, the rural poor and small businesses. Let’s hope the 100 day plan does a better job that the Alotau II Accord (see here for a critique) in actually focusing on the development of the PNG people. May PNG change its image from “mountains of gold in seas of oil” to something of greater benefit such as “mountains of culture in rich seas of diversity”. There is still lots of money, as well as better social development outcomes, in a new motto which re-focuses PNG’s development effort.